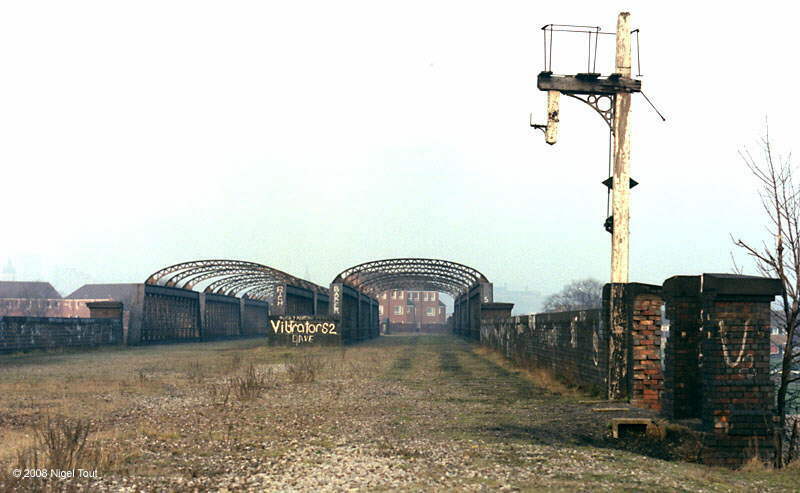 This is a small selection of photographs of Great Central Railway structures south of Nottingham Victoria after closure and during demolition. Unfortunately, I missed out on recording the demolition of Nottingham Victoria station, which occurred in the late 1960s. This page is arranged north to south. Panoramic photograph looking east from the Broadmarsh multi-storey car park over the GCR viaduct, in Feb. 1975. The Great Central Railway is in the foreground with Weekday Cross Junction on the far left, beyond which a tunnel leads to the site of Victoria station, and a girder bridge on the right, heading south. The GNR viaduct heads off from Weekday Cross Junction towards the right background and to London Road High-level station and Colwick. 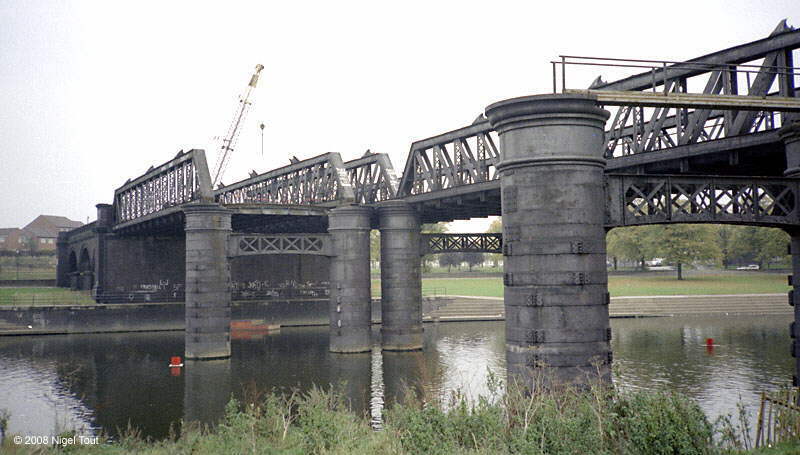 The GCR viaduct here has been demolished and replaced by a concrete viaduct and new bridge for the new NET trams. Just south of Weekday Cross Junction the Great Central crossed the rival Midland Railway station on a series of massive bridges. Just what the Midland Railway management said when they heard of the plans for this is not recorded! Seen here looking south in November 1973, this is now the southern terminus of the NET tram system, see the photograph below. A later photograph (February 2007) from a similar position as the previous photograph showing the then southern terminus of the NET tram system on top of the GCR viaduct, with a tram waiting on the near platform. 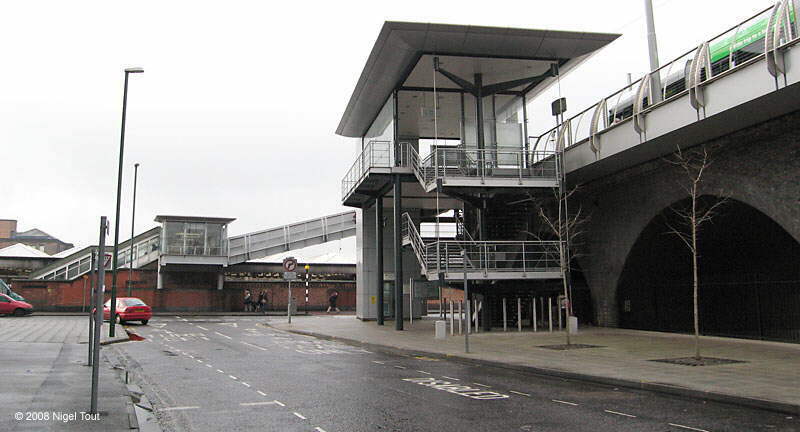 Since the extension of the tram network southwards this station has been replaced by one on the bridge over the Midland station. 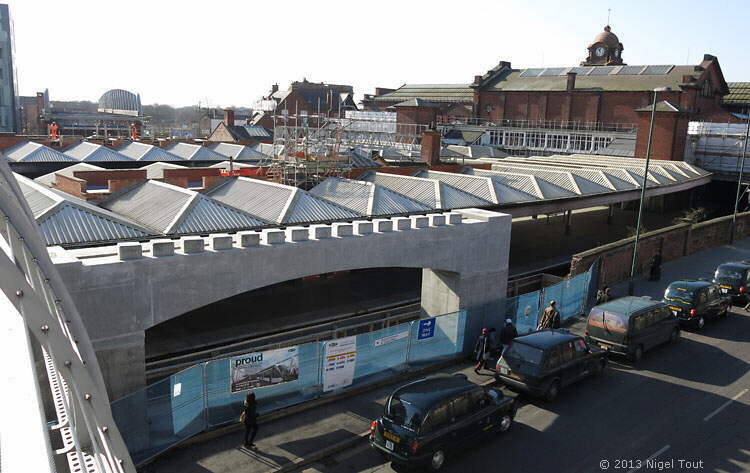 In December 2012 work was under way building another bridge across the ex-Midland Railway station to carry the extension of the NET tramway. A new concrete arch support can be seen in front of the taxis which helps carry the new bridge along the path of the old GCR bridge. Among the station buildings the new bridge uses some of the original foundations of the GCR bridge. This is the view southwards from the present tram terminus across the ex-Midland Railway station in early March 2013. The new concrete support for the tram bridge is in the foreground and the new bridge itself can be seen in the distance, poised to be moved into position over the station some time in the coming months. The footbridge on the left will later be removed and a tram-train interchange built on the new bridge over the station. Work started at the end of April 2013 to slide the 104 m long bridge over the railway station at a rate of about 10 m each night. By 6th May it had been moved half way across, as shown here, looking north with the current tram terminus on the GCR viaduct on the far side of the station. Who would have thought that all of this would be rebuilt when it was so sadly demolished all those years ago. Back to photographs of the original GCR bridge, looking east along Station Street showing the massive span crossing the Midland station. A closer view of the span across the Midland station, which was rebuilt shortly after the Great Central opened, seen here looking west in January 1975. 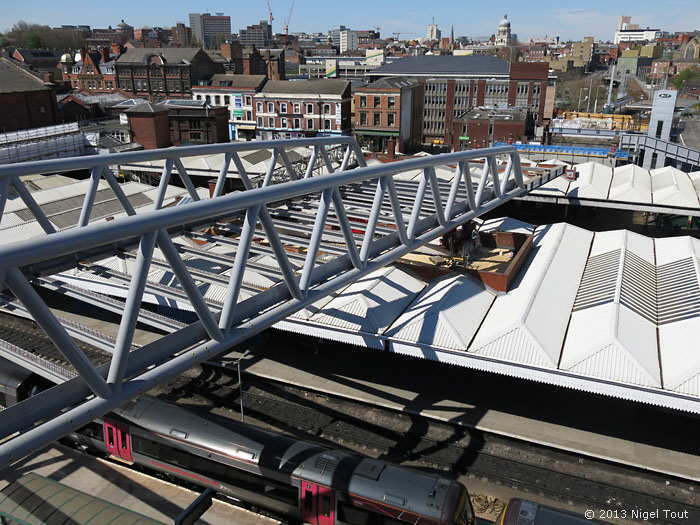 From the platforms of the Midland station the GCR bridge was equally imposing. “Peak” diesel locomotive number 98, with the steam heating on, was waiting to depart westwards, in April 1969. 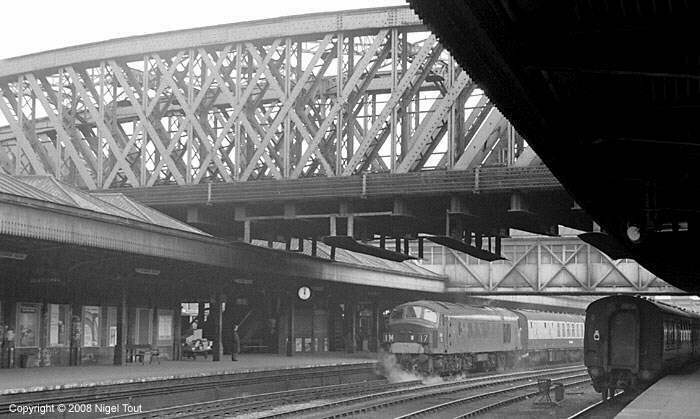 The GCR bridge over the Midland station was demolished in the early 1980s. 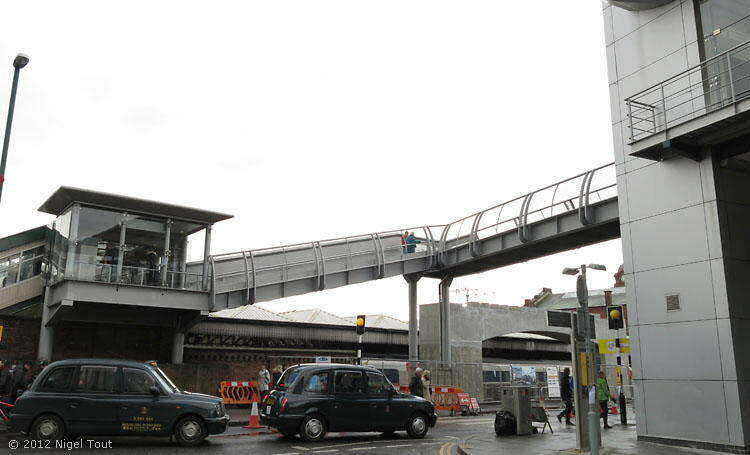 This view at Station Street, on the north side of the Midland station, shows the gap in the canopy where the bridge passed across. The NET tram system has now extended southwards here and a new bridge has been constructed over the Midland station again with a tram-train interchange station on top. Panoramic photograph from January 1975 of the Great Central viaduct and bridge over Queens Road on the south side of the Midland station, looking west. The bridge over the station is on the right. 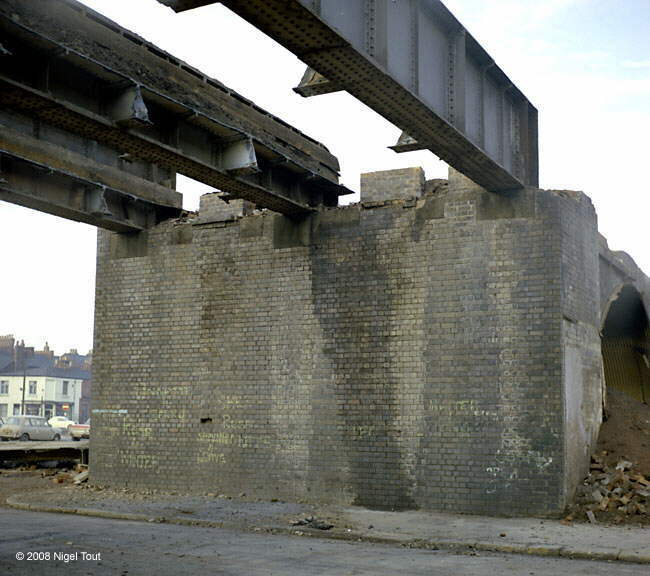 The Great Central viaduct and bridge and over Queens road were also demolished in the early 1980s, as shown here. A closer view of the demolition of the Great Central bridges and viaduct on the south side of the Midland station. 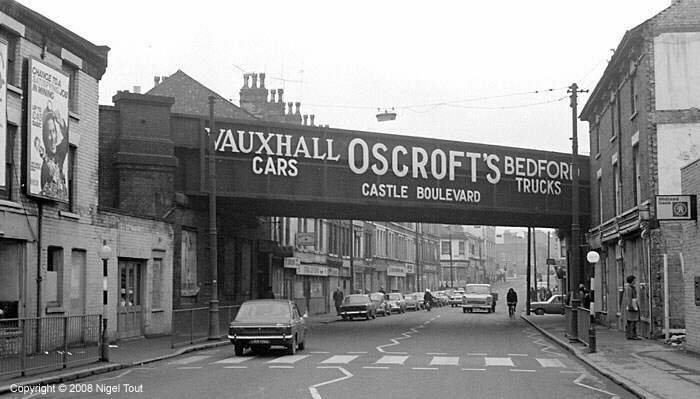 An evocative photograph of the bridge over Arkwright Street, looking north in January 1975. This area has since been completely redeveloped and is now totally different. 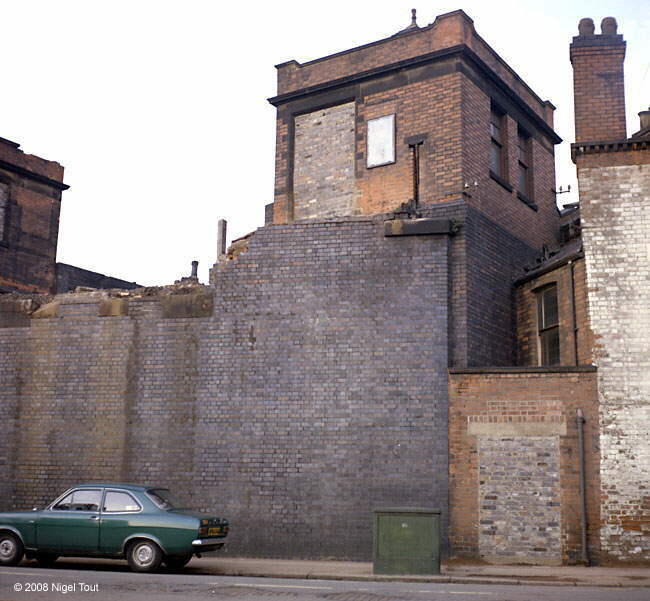 The remains of Arkwright Street station in February 1975. The entrance doorway, at bottom right, has been bricked up. Compare with the photograph taken in 1969 in the Trip to Nottingham & Rugby section. 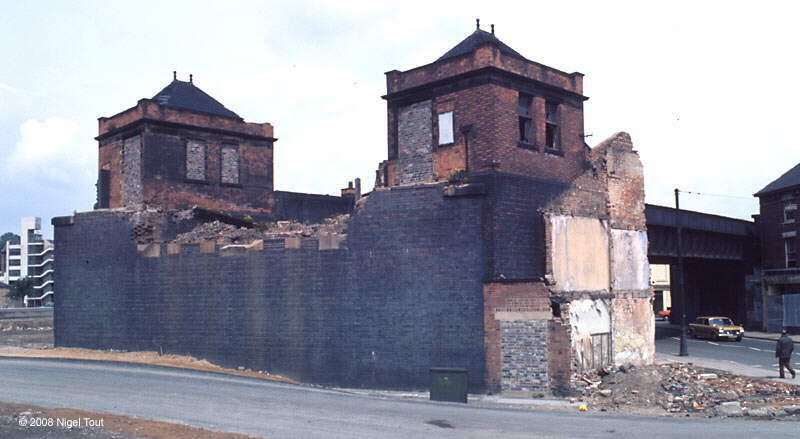 Another view of the demolition of Arkwright Street station. The platforms extended along the top of the viaduct on the right. Panoramic photograph taken in Jan. 1975, looking east, of the viaduct which supported Arkwright Street station. The entrance buildings shown in the photographs above can be seen on the far left. All of the terraced housing in this area was demolished too as part of a large redevelopment. The bridge shown in the previous photograph, in the final stages of being cut up. 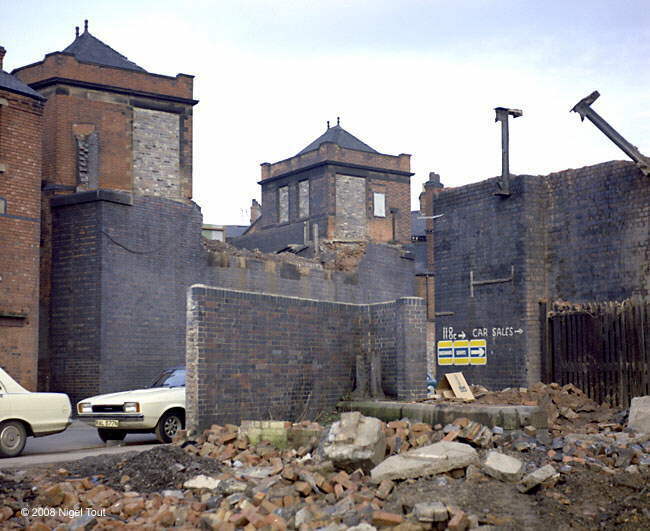 By May 1976 the redevelopment of the Meadows area around Arkwright Street station was well under way and the layout of roads and houses underwent radical changes. In this panoramic view the remains of Arkwright Street station, just right of centre, can be seen in relation to the Midland station at left. The road on the left leading to the Midland station is Sherriffs Way and the road on the right is Meadows Way. 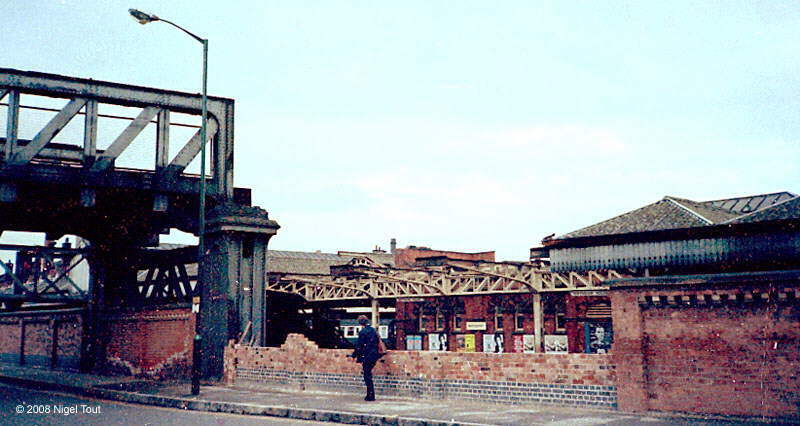 The entrances to Arkwright Street station remained because the brickwork also supported the bridge which was still in place over Arkwright Street, in the background. Moving further south we encounter the bridges over the Victoria Embankment and the River Trent. In the background are the bridges over the River Trent, while in the foreground are the bridges over Victoria Embankment, looking south. This photograph was taken standing on one of the bridges over the River Trent, looking north. 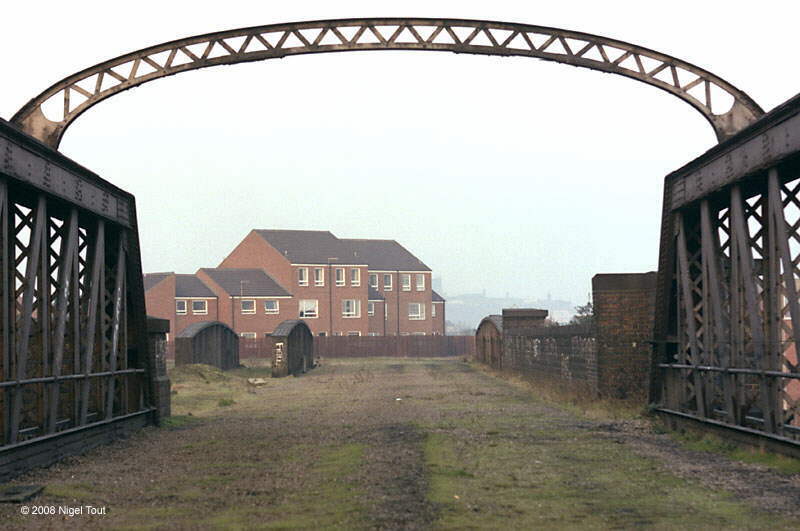 The goods yards which lay beyond have already been redeveloped with housing. Having crossed over the Trent and turned round, looking north, with a dejected-looking signal post. There were four tracks at this point, with two going over each bridge. 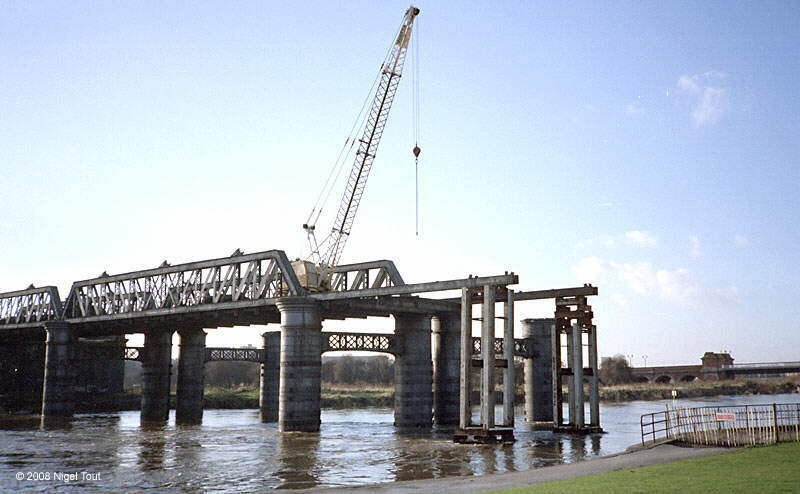 In October 1985 demolition of the bridges over the River Trent had started, here looking west. ... and in another week or two, with the river much higher after heavy rain, demolition has started on the east bridge.